Not for the first time over the past year, the New York Times faced backlash from liberal readers after a Saturday op-ed argued White House senior adviser Stephen Miller should be involved in negotiations to strike an immigration deal. 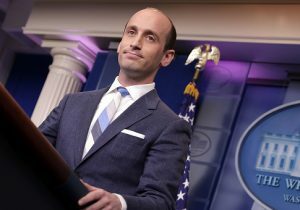 In "The Necessity of Stephen Miller," Ross Douthat argued that although he did not agree with Miller's immigration stances, the White House adviser represented the roughly one-third of Americans who were restrictionists, as well as many of the Republican lawmakers whose support would be needed to pass immigration law. "A bargain that actually reflects the shape of public opinion, not just the elite consensus, can only happen with someone like Stephen Miller at the table," Douthat wrote. Miller, known for his hardline views on immigration, has been criticized in the past for associations with some white nationalists, including Richard Spencer. Miller was an undergraduate student at Duke University at the same time Spencer was a graduate student. The White House adviser, who was raised in a Jewish family, has since said he has "absolutely no relationship" with Spencer and that he "completely repudiate[s] his views." Nevertheless, many of the critics charged that the Time‘s decision to publish the piece defending the so-called "white nationalist" Miller on Holocaust Memorial Day was offensive, and they called for readers to cancel their subscriptions. The Times faced similar backlash from liberal readers last May when right-leaning columnist Bret Stephens wrote a piece on climate change. At the time, one reader said the paper was "slammed with people canceling subscriptions" because of the new columnist expressing a varying viewpoint. Times reporters seemed somewhat unfazed over the weekend by the charge that "white supremacism" was the guiding principle of the paper.